Why is My Immune System Attacking Me? Do you or anyone you know suffer from diseases such as Type 1 Diabetes, Psoriasis, Rheumatoid Arthritis, Multiple Sclerosis, Systemic Lupus, Hashimoto’s, or Irritable Bowel Syndrome? At first these conditions seem very different from one another, some involving muscles, joints and nerves while others seem to affect the digestive system and skin. What could these complex and very different diseases have in common? 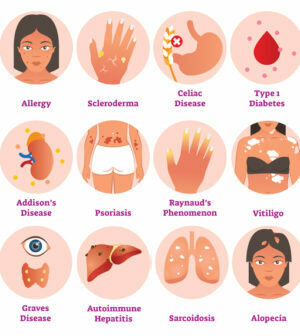 They are among the 80-100 different autoimmune conditions that have been identified by researchers. Autoimmune conditions are categorized by a dysregulation of the immune system whereby the immune cells begin to attack the body’s own organs and tissues. Over the past 30 years, the incidence of autoimmune diseases has increased by a staggering 19% with costs to the healthcare system of over 100 billion dollars as compared to cancer at about 57 billion dollars. Autoimmune disease commands roughly 591 million dollars in funding for research annually but nearly 5 times that amount is spent researching heart disease and nearly 12 times that is spent on cancer research, both with significantly lower prevalence. Common conventional medicine treatments largely emphasize pharmaceuticals that suppress or stop the immune system. These medications often disrupt an individual’s normal immune function making them more susceptible to other diseases and infections. Additionally, many medications come with lists of side effects that create a new set of problems. There are many factors that have been identified as triggers for immune dysfunction. Environmental toxins, stress, food reactions, medications and vaccines are the most common. When we focus treatment on identifying and treating the cause of these diseases rather than suppressing the immune system, we can begin to move the body in the direction of healing and attempt to restore normal immune function. The digestive tract is the only internal organ system that is actually continuous with the outside environment making it particularly susceptible when exposed to unhealthy things in our diet and the outside world. It would stand to reason that the health of the gut, the wall of the intestine and the good bacteria that live there would be an important army in creating a barrier between our internal environment and the outside world. Both dysbiosis, or an imbalance of healthy gut bacteria, and adverse food reactions lead to a disruption in this barrier allowing for autoimmune diseases to develop. The microbiome, or bacteria in the intestines, is made up of trillions of different species of bacteria. This colonization of bacteria works in concert with the body’s immune system to create a defense against the intestinal wall. The microbiome also provides vital nutrients for a variety of functions in the human body. Any disruption of this system such as a lack of “good” bacteria commonly known as probiotics, or an overgrowth of “bad” bacteria or pathogenic bacteria, can lead to inflammation and changes in immune function. These alterations in the microbiome can be caused by toxin exposure through food and the environment, internal production of toxins within the gut, consuming known food allergens or intolerances, prescription drugs, antibiotics, and stress. Consumption of food allergens and toxins results in increased intestinal permeability or “leaky gut” meaning that the absorption of the contents of the gut is amplified and the body takes in things it doesn’t want or need. These perceived “invaders” then trigger immune complexes that circulate through the body and begin to cause damage and eventually disease. Systemic Lupus Erythematous is a known autoimmune disease affecting at least 1.5 million people in the U.S. Research has shown that certain bacteria promote the onset and progression of the disease upon the penetration of the “leaky” intestinal wall. In cases of Type 1 Diabetes (T1D), studies indicate that intestinal hyper-permeability occurs prior to the onset of the disease. Adverse food reactions can be classified as allergies, sensitivities and intolerances. Often a patient will see an allergist for the standard skin prick test and find that they are allergic to things such as nuts, pollen or cats. They may have a severe allergy and anaphylactic reaction or complaints of stuffy nose, watery eyes, or itchy throat. This represents only one type of immune reaction. There are other delayed and chronic immune reactions that can be assessed and contribute to a dysfunctional immune system. In addition, an individual may have food intolerances that do not directly involve the immune system but involve nutritional deficiencies and the body’s ability to break down and eliminate certain foods. Clinical research has shown that the resulting “leaky gut” related to these adverse food reactions is an important causative factor in many autoimmune conditions. Naturopathic doctors can further evaluate patients to differentiate these types of reactions. Now that we understand the physiological mechanisms that contribute to autoimmune diseases, how can these causes be addressed? How do we repair the microbiome and the “leaky gut”? Each autoimmune disease may have a unique presentation of symptoms and each individual may have unique triggers for immune dysfunction. While individuality in treatment is important, there are several areas of focus that will help most people suffering with autoimmune diseases. 1. Reducing stress is critical. Stress has been shown to adversely affect the gut microbiome. A review of randomized control trials including data from 1602 participants showed a significant change in immune cell activity after participation in Mindfulness Based Stress Reduction. Guided mediation, yoga, prayer and time spent in nature have all been shown to reduce stress and would therefore improve immune function. 2. Decreasing environmental toxins. Promoting the body’s ability to eliminate toxins is another important aspect of treatment for autoimmune diseases. Herbicides, pesticides, fertilizers, car exhaust, mercury amalgam fillings, plastics, detergents and household cleaners make up only a fraction of the potential sources of toxins in our environment. Research has shown an increased incidence of Lupus among farmers exposed to herbicides and pesticides. Reducing exposure to such toxins by choosing cleaner products used both in and around the home, consuming unprocessed organic whole foods, and having mercury fillings removed are ways to begin mitigating environmental exposure known to affect autoimmunity. Participating in a supervised detoxification program with a licensed naturopathic doctor can significantly reduce the body’s toxic burden and improve immune function. Including foods that improve detoxification such as spirulina, chlorella, turmeric, ginger, leafy greens, broccoli and other cruciferous vegetable, garlic and of course increasing your water intake will help your body manage toxin exposure on a daily basis. 3. Eliminating processed foods. One of the easiest ways to affect autoimmunity and the gut microbiome is through our diet. A recent study from 2018 provided evidence that artificial sweeteners are toxic to gut bacteria. Eliminating foods that are known to disrupt gut bacteria and cause inflammation such as sugar, processed and packaged foods, artificial food dyes and sweeteners, and alcohol will improve the health of the digestive tract. 4. Determine adverse food reactions. Celiac Disease is an example of an autoimmune disease for which there is specific testing available to evaluate tolerance of gluten. Unfortunately, it is not as straight forward for other conditions. Naturopathic doctors are able to go a step further and evaluate an individual’s adverse food reaction triggers. By determining these foods and avoiding them, the body is able to begin healing the “leaky” intestinal wall and rebuilding the immune system. 5. Add herbs and probiotics to diet. Oregano oil, Berberine, Artemisia Asia, and Peppermint are herbs that may be used in eliminating the “bad” microbes. Probiotics in the form of capsules, powders, and fermented foods are critical in treating autoimmunity and “leaky gut”. Eating yogurt is just not enough, even if it’s Greek yogurt! Finding a good quality probiotic with at least a 10 billion count of bacteria and a variety of different microbial strains is necessary for efficacy. Consulting a holistic healthcare provider can help guide you to a high-quality product. 6. Check Vitamin D levels. Ensuring optimal Vitamin D levels is important for all individuals with autoimmune disease. Vitamin D is not a vitamin, it’s a hormone! Like all hormones, Vitamin D is responsible for many things in the body including calcium regulation and bone metabolism as well as immune regulation. Vitamin D has a very specific role in activating detoxification pathways that eliminate a substance called Lithocholic acid, a bile acid that is toxic to the cells of the intestinal wall. Some probiotics actually increase Vitamin D levels. Vitamin D also increases the activity of peptides that increase intestinal barrier function. While many people know that Vitamin D is important for their immune system, much of this mechanism occurs through the gut and the microbiome thereby effecting autoimmunity. Autoimmune diseases are extremely complex conditions that require an individualized approach. However, these common factors can influence the development, onset, and severity of symptoms in autoimmune diseases. Naturopathic doctors work directly to stimulate the body’s vital force or the ability of the body to heal itself. By eliminating toxicity, providing adequate nutrients, building a robust microbiome, and stimulating the body to restore normal immune function, individuals with autoimmune disease have another approach to consider when navigating their health. As research catches up to the art of medicine, natural options for treatment will be more readily available. Autoimmune disease, like all of us, is marked by diversity and challenges. It is shared understandings across these varied conditions that will bring us forward to health and healing. Dr. Firisin is a licensed naturopathic doctor and medical director of Coastal Natural Medicine in Southport, CT. She brings over 20 years of experience in healthcare to her practice with a focus on gastrointestinal conditions, autoimmune and thyroid disorders, cardiovascular health, and detoxification. Please call 475-999-2032 or visit: www.coastalnaturalmedicine.com to learn more.